“By identifying radios with operational problems and addressing them, an agency will experience a higher level of system performance and reduce maintenance costs by 50% or more,” said Joseph Rey, managing partner of LocusUSA. LocusUSA, a leader in the area of radio frequency (RF) capture for radio analysis and location, today released a new white paper, “The Power of Proactive Radio Maintenance”. 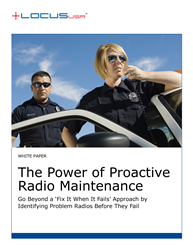 Locus developed the white paper as part of its ongoing effort to find innovative ways to assist public safety agencies in performing proactive, preventative radio maintenance on their subscriber radios. First responders put their lives on the line each day to protect the public from harm, whether it is a routine traffic stop or an emergency. It is vital their radio equipment works properly to provide them with clear and reliable communication when they need it the most. Approximately 15% to 20% of subscriber radios can drift out of alignment annually, causing them to fail at any time. Many public safety agencies have anywhere from 2,000 to 10,000 radios or more on their land mobile radio systems. Technicians do not know which radios need to be aligned, and which ones are working well, without bringing all the radios in for testing. The common practice of testing all radios leads to spending hundreds of thousands of dollars in time and manpower each year. To view the white paper in full, visit http://www.locususa.com/about-us/white-paper. LocusUSA is an engineering and software development company located in Melbourne on the Space Coast of Florida since 2001. It is a leader in the area of RF capture for radio analysis and location. The ability to capture and analyze the actual waveform of a radio transmission led to the development of DiagnostX, a patented system that can measure the alignment and operating characteristics of a radio long-range, over-the-air in real-time without user intervention. To learn more, visit http://www.locususa.com or connect with LocusUSA on LinkedIn, Twitter, Facebook and YouTube.